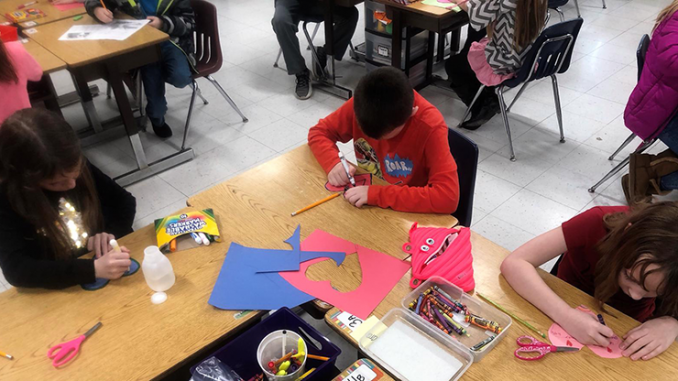 “I want to make them feel better,” said Raeleigh Caldwell, a student in Brittni Tuttle’s third-grade class at Lynn Camp Elementary. The assignment was to create paper heart Valentine’s Day cards to mail to the children at St. Jude’s Hospital. For many students it was much more than an activity, it became personal. Other students in Ms. Tuttle’s class agreed, as they cut and decorated the cards with care. More important than cutting out a perfect heart shape, or coloring inside the lines, was the personal messages that students shared with their friends at St. Jude. Ms. Tuttle plans on mailing the cards to St. Jude in plenty of time for the kids to receive them for Valentine’s Day next week.